Repost: Are the Nats suddenly a 100-win team? With this offense, yes. (Editor note; I attempted to publish this last Friday, then the server immediately went down all weekend. Wanted to re-post it to get commentary from typical readers. All numbers below were as of last friday, before the wild 4-game series against Atlanta). Nats pundits are already discussing this impact on a playoff race, who the replacement may be (with John Lannan getting an early audition during this weekend’s double header), and whether we should flip someone out of our “thinned” farm system for a rental SP like Zack Greinke or Ryan Dempster (I put “thinned” in quotes out of deference to those that don’t share my glass-is-half empty opinion on the state of our farm system right now as posted here earlier this week). Inarguably, this team will be a worse team without Strasburg. We’d be weaker in September once he got shut-down and we’d be hampered in a short series without our staff Ace. I’m not worried about September though; remember last year? Some teams were fielding 40-man roster specials, with lineups that mostly started the year in AAA. And I’m not entirely worried about how we’d look in a playoff series, since playoff rotations go 4 deep (meaning whatever question mark we’re throwing out there as a 5th starter in September is in the bullpen in October), and a rotation of Gonzalez, Zimmermann (who, amazingly, is tied for the NL lead in pitcher bWAR right now), Jackson and Detwiler getting the game 4 start is still pretty durn good. But, here’s some interesting stats that should give you (and anyone in baseball frankly) some pause; this team is positioned to get significantly better from here on out, despite the looming loss of Strasburg and despite the fact that they’re already in first place. Why? Because the offense is really starting to heat up. When the Nats score 0,1,2 or 3 runs, they are 14-28, for a .333 W/L percentage. This is pretty common; even last year’s 102-win Philadelphia team rarely won when scoring 3 or fewer runs. When the Nats score 4 or more runs? They are 39-9 this season, a .795 W/L percentage. Taking this a step further, when the nats score 5 or more runs, they’re 29-6, a .828 W/L percentage. (For context, a record of 100-62 equates to a .617 W/L percentage). Look specifically at the average number of Runs Scored by this team. It is distinctly trending up; from 3.36 RS/game in April to a massive 4.78 RS/game so far in the month of July. That’s almost 1 and a half more runs they’re scoring a game right now as compared to April (when their 14-8 record was mostly on the backs of one of the best opening months of starting pitching seen in the Majors since the dead-ball era). Some reasons for this outburst of runs? Ryan Zimmerman‘s cortisone shot on June 24th: he had a .589 OPS in June (which should have been even worse, but he finished the last week of June on a tear, going 11-32 with 5 extra base hits after getting his shot), but has a blistering 1.280 OPS so far in July. The top of the order stepping it up: Danny Espinosa is hitting .327 in July and Lombardozzi is hitting nearly as well. 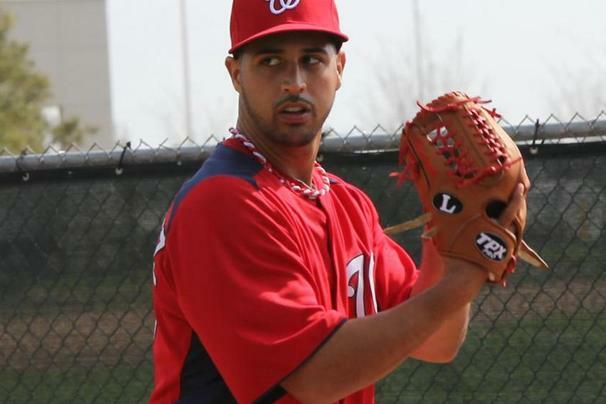 The resurgence of Roger Bernadina, hitting at a .375 clip so far in July and leading to the DFA of Rick Ankiel (my wife’s favorite player; I havn’t broken the news to her yet). Meanwhile, the rest of the sluggers in the lineup (Harper, LaRoche, and Tyler Moore doing his best effort to prove scouting pundits wrong who thought he couldn’t hack it against MLB pitching) are for the most part churning along and providing pop in front of and behind the 3-4-5 hitters in the order. And, this offense could only get better when Jayson Werth returns. Remember; he was quietly having a solid year at the plate, with an .810 OPS and a 121 OPS+. You insert Werth and suddenly this team is rock solid and full of power from position 2-7. You’d have to sacrifice Bernadina and Moore to the bench primarily, but they’re great insurance in case Werth’s wrist betrays him. They’re averaging 4.78 runs a game, and on the season they’re 39-9 when they score 4 or more runs. That spells a pretty serious run I expect this team to make in the next month and a half, especially against a slate of opponents that are mostly .500 or below. Right now, sitting at 53-37 they’re on pace for a 95 win season … but, amazing as it is to say it, this team easily has the capability of reaching 100 wins if their offense continues its upward trend. Are you concerned about the state of the Nats farm system? 1. ESPN’s Keith Law posted a mid-season review of farm systems on the Rise or Fall (sorry, insider only), and stated the obvious about our system. His summary: Yes we got Lucas Giolito but it was essentially at the expense of any other high-end talent in the 2012 draft. And, a lot of our high-end guys are taking significant tumbles on boards due to lack of performance or injury (see later on for a look at our top 10 prospect performances). 2. Baseball America’s Jim Callis posted an updated Midseason top 50 prospects post 2012 draft and included where he’d put the top-end talents drafted (including international signees) in his weekly Ask BA feature on July 16th. Of note to me was the fact that Washington, even with the signing of the high-end Giolito, does not have a SINGLE player in his mid-season 50. Luckily for us, our NL East competition didn’t fare too much better, with a grand total of 5 players between our divisional rivals. This compared to teams like Seattle (5), Kansas City (4), and the rich-keep-getting-richer Rangers with 3 guys likely to become impact players within a year or two. 1. If you’re not going to matriculate your prospects and depend on them for production, then you need to utilize them in trade to acquire needed talent. There’s plenty of trade rumors right now mentioning the Nats desires for a starter to cover for Stephen Strasburg‘s innings limit. But who are we going to trade to acquire said pitcher? I’d go as far as saying that there’s not one guy on our 2012 top 10 prospect list (not including Harper and Lombardozzi of course) who, at this point in 2012, could be the centerpiece of a marquee acquisition. Who is trading for our #1 prospect Anthony Rendon right now? 2. This team has a LOT of money committed to players over the coming years, and won’t be able to depend on hefty production from salary controlled guys forever. They will need a stream of up-and-coming players to offer cheap alternatives to free agents and players who have become too expensive. For example; in the year 2016 the team has $47M committed to just THREE players right now, before considering at least that much in arbitration for just Strasburg, Bryce Harper and Jordan Zimmermann. $47M is nearly the team’s payroll just a few years ago! Yes we will naturally grow payroll and revenues with success and the renegotiation of the MASN contract, but constructing a 25 man roster is about making choices. The last thing we want is to see this team become the 2012 Philadelphia Phillies; a bloated, old team with a ton of injuries and the 2nd highest payroll in the league at $175M, but mired in last place. That’s 2 guys who are starters in the Majors, 3 traded for Gonzalez, 4 guys on long term DL stints and Eury Perez with his meager .667 OPS in AA, in his 6th pro season. How about 2012’s list? 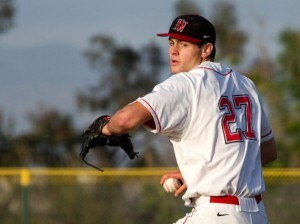 2012 5 Matt Purke, LHP Long term DL (Shoulder concerns); hasn’t thrown in 5 weeks. 2012’s list includes 4 major injury concerns, two guys under-performing (Hood and Taylor), and two guys matriculated to the majors. The two players putting up good statistical seasons may come with astericks though; Alex Meyer was compiling his stats in low-A, going against guys 2-3 years younger than himself. His promotion to High-A was overdue and should be telling, to determine if his future lays as a dominant 12-6 starter or a high-leverage reliever. Brian Goodwin’s excellent season is a great sign of things to come … but again, in Low-A. I know he was a Juco signee, but he’s 21 now, turning 22 in November and is the same age as college juniors getting drafted now. If he continues to produce upon promotion to better competition, I’ll feel better. Now, I know there’s guys in our system who are coming back from injuries (i.e. Nathan Karns), or who are putting up good numbers despite being lower draft picks (i.e. Matt Skole, Cameron Selik, Danny Rosenbaum), and we have some guys who we acquired through trades and who are having surprisingly good seasons in the minors (i.e., Zach Walters, Ryan Perry and Corey Brown) but are these kinds of players going to step up and either be a) next year’s top prospects or b) eventual productive major leaguers? I know we all love Rosenbaum for example, but most scouts think he’s a marginal prospect at best (and his lack of inclusion on our top 10 lists reinforces that notion). This sudden lack of depth was one of the reasons I wasn’t the biggest fan of drafting Giolito. With the new draft rules and specific limits on bonuses, combined with the significant injury issues we’ve had with high end draftees Rendon and Purke in 2011’s draft, I thought the team should have gone the safer route. Yes I’m sure Mike Rizzo did a ton of due diligence and was confident in Giolito’s long term health. But missing on three first rounders (or in Purke’s case, a first round talent given a significant bonus and a 40-man deal) could lead to a significant hole in player development for this team right at a time a couple of years from now when they desperately need a MLB-minimum impact guy. Wang hits the DL. Photo via Washington Nationals. Has anyone else heard or read anything in the beat reporter’s works over the past week or so about Wang suffering from a hip strain? I didn’t think so. I’ve read lots about mechanics, ineffectiveness and an inability to work efficiently out of the bullpen, but nothing about a hip issue. 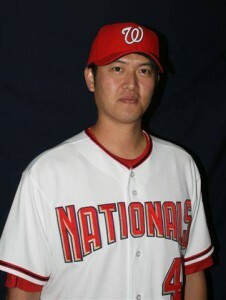 See, that’s just about the day that Stephen Strasburg is likely to hit his 160 inning limit for 2012. He’s been averaging 5.8125 innings per start (93 IP in 16 starts). That gives him about 12 starts left. The team is thinking of making Strasburg the 5th starter in the rotation after the break. That’d put his first start back on 7/17 at home vs the Mets, and counting 11 more starts after that roughly has Strasburg making his last start on 9/12, meaning the team would need Wang back and effective on 9/19. Lots can happen between now and then of course; another starter could go down with injury and the team could have rain-outs that force their hands (they’re already looking at a call-up or a spot-start twice between now and mid September due to re-scheduled rainouts). Or, the team could lose one of their long-men out of the pen and need a mop-up guy in the interim. Either way, I think Wang’s career with the team may be at an end. Ross Detwiler profiles more closely to the Mike Rizzo prototype pitcher; a power guy who gets lots of swings and misses. Wang has admirably come back from shoulder surgery but he just hasn’t been able to put it together in 2012, and when his signature sinker isn’t working, he’s batting practice fodder. Look for the team to make due with its current rotation as long as they can. (Note: i’m copying a large chunk of 2011’s version of this post to give a running history of the Nats all-stars later on below). Narrative: The two starters Strasburg and Gonzalez were the obvious candidates, and my personal prediction was that they’d be the only two candidates selected. The inclusion of Desmond is a surprise, but also a testament to how far he’s come as a player in 2012. I entered the season figuring that Desmond would be closer to a demotion than the all-star team, and his power from the short stop position has been a huge shot in the arm to our challenged offense. LaRoche has had a fantastic come back season but fared little shot against better, more well-known NL first basemen so his non-inclusion is not too surprising. Stammen has been our best bullpen arm, but like LaRoche fared little chance of getting selected during a year when the Nats had two deserving starters. Lastly Mr. Harper; he wasn’t on the ballot so fared little shot of being included, but has been put on the “last man in” ballot, up against a series of established veterans and future hall of famers. We’ll see if celebrity wins out. Before his slump the last two weeks he was clearly among the best hitters in the league despite his age. (Editors Note: Harper was subsequently added on 7/7/12 to replace the injured Giancarlo Stanton). Coincidentally, I thought Matt Kemp‘s decision to go public with his snub of Harper for the home run derby was both short sighted and disappointing. If I was Bud Selig, I’d take the opportunity to make this year’s derby the most watched mid-season baseball event ever by forcing the inclusion of both Harper and uber-rookie Mike Trout. Ask yourself this: 1) do you bother to watch the home run derby now? And 2) if Harper and Trout were in it, would you watch this year’s version? For me, even as an avid baseball fan I don’t bother to watch the event and wasn’t planning on it this year … but with these two guys in, it’d be must-see TV. I hate it when Baseball misses such an obvious chance to showcase players and take advantage of the prevailing storylines of the season; it seems to happen year after year. For a trip down Memory lane, here’s the Nationals all stars by year and talk about their selection, whether they were deserving, and who got snubbed each year. Narrative: Soriano made the team as an elected starter, the only time the Nats have had such an honor. Our pitching staff took massive steps backwards and no starter came even close to meriting a spot. Cordero was good but not lights out as he had been in 2005. Soriano’s 40-40 season is a poster child for “contract year” production and he has failed to come close to such production since. The team was poor and getting worse. Johnson had a career year but got overshadowed by bigger, better first basemen in the league (a recurring theme for our first basemen over the years).